Failure is an inevitable part of life, something that we all have to deal with. Some people handle failure more harshly than others, and cannot seem to cope with their mistakes. 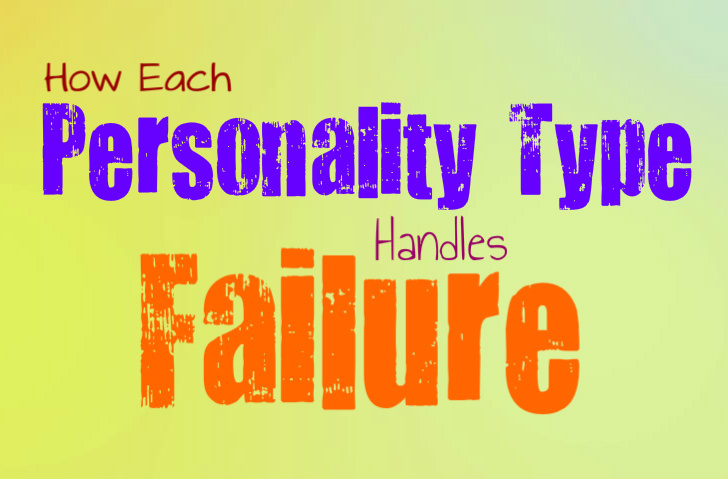 Here is how each personality type is most likely to handle failure. INFJs are perfectionists, which often causes them to struggle with their own failures. When they make mistakes INFJs can be unbelievably hard on themselves. They will often punish themselves for a long time, feeling like they could have done better. This can cause the INFJ to feel bottled up, and have a hard time moving forward with projects. Sometimes they will refrain from trying anything new, simply because they are afraid that they will fail once again. This can be a struggle for INFJs, and is certainly something that they need to work on. It is important for them to be around people who help them to forgive themselves for their mistakes. ENFJs often push themselves very hard in an effort to avoid failure at any cost. They are extreme perfectionists, and often take on far too much work all by themselves. ENFJs dislike feeling like they have failed, and will often do whatever it takes to fix the problem. They will sometimes exhaust themselves trying to be sure that everything goes smoothly. ENFJs can be very hard on themselves if they feel like they have failed at something, and will try hard to compensate for that mistake. They need to learn that no one can be perfect, not even them. They certainly come close, juggling handfuls of tasks at once in an attempt to take care of everyone around them. INFPs are very idealistic people, hoping that they can live up to their own internal standards. INFPs are also very morally driven individuals, and can sometimes feel disappointed in themselves because of this. They can sometimes get caught up in the fear that they will fail, which can cause the INFP to avoid attempting a task at all. They do not want to let others down, especially the people they care for the most. Sometimes INFPs can be harder on themselves than other people realize, especially when it comes to making the right choices in life. ENFPs are often the type of the people to push through their fear of failure. They enjoy taking chances, and will often charge head first into a new challenge. ENFPs have a way of coping with mistakes, and will search for a way to learn from their various failures. They understand that it is important to take chances, and that the only way to learn is to really try. In most cases ENFPs would regret not doing something, much more than they would regret trying and failing. They enjoy pushing themselves and often live with the mindset that things will work themselves out somehow. INTJs often do their best to prepare themselves for any situation, in hopes that they can avoid failure. They will research a project until they understand everything about it, and will ultimately work on devising the most effective plan. INTJs are great at figuring out the best way to accomplish their goals, and will often dive into completely. They will fully immerse themselves in a project so that they can learn everything they can about it. INTJs often approach their fear of failure, by attempting to prepare themselves for the worst. They will equipped themselves fully with everything they need to be completely successful. ENTJs will often prepare themselves for any possible situation, which makes them less fearful of failure. They are good at finding a solution to a problem once it arises, and will push through in order to get things done. ENTJs value efficiency, which makes them pride themselves on being able to avoid failure at any cost. They usually surround themselves with a team of people who can ensure that everything gets done properly. ENTJs are very focused on accomplishing their goals, and are often good at avoiding failure. When things to fall apart though, ENTJs will become upset at first but then search for a way to fix the problem. INTPs can sometimes suffer from a crippling fear of failure, especially since they can often see various outcomes to a situation. They will often analyze a problem for a long time before feeling comfortable enough to move forward. INTPs are great at seeing potential problems that can arise, and will often think something over long before they take any action. This ability to see potential problems can sometimes cause the INTP to stand still for a while, because they are fearful that they have overlooked something. It is important for them to understand that no path can be perfected, and to trust in their ability to alter their plan in the moment. ENTPs are very imaginative people, who enjoy taking on new challenges. ENTPs will often become excited by a project that has he potential to fail, because they will see it as a real challenge for them to succeed. They enjoy thinking up new ideas and new ways to solve something. ENTPs can become uneasy if they take on too many projects that do not succeed, and will see this is a blow to their confidence. If things are going well though, ENTPs are excellent at taking on new challenges and finding ways to avoid failure. ISFJs care very deeply for those around them, which can cause them to be rather hard on themselves. If they feel like they have failed to care for their loved ones properly, the ISFJ will become distraught. They simply want to ensure that the needs of their family and friends are met, and that they are keeping peace in their environment. ISFJs take the responsibility on themselves to ensure that those closest to them are happy and completely cared for. They will consider it a huge failure if someone they love is not succeeding and is unhappy in their lives. ESFJs can be extremely hard on themselves, and often want to live up to their loved ones expectations. Their fear of failing can be overwhelming sometimes, especially if they feel like they will disappoint those closest to them. ESFJs are always trying to please others, and because of this they might take failure very hard. They simply need to learn to accept that they cannot be perfect, and that people will love them even if they make mistakes. They struggle to forgive themselves for their failure, and will often have a hard time overcoming this. ISTJs are very hard-working people, and can often take failure very harshly. They want to be successful and are constantly striving to be the best that they can be in everything that they do. ISTJs can sometimes set high standards for themselves, ones that they wish to live up to at all times. This can be a bit overwhelming for them, especially in situations where they aren’t living up to their own standards. ISTJs are often skilled at navigating many situations though, and will do whatever they can to succeed. ESTJs do not take failure well at all, since they value efficiency above anything else. They want to be the very best at everything they do, and they work very hard to accomplish this. ESTJs will often feel horrible about themselves if they are not living up to their own standards, as well as the expectations of their loved ones. They want to be able to provide for those closest to them, and will feel like a failure if they cannot do this. ESTJs are often skilled at accomplishing their goals though, and will usually find a way to get the job done no matter what. ESTPs are very driven people, and might have a hard time handling their own failures. They often set rather high expectations for themselves, which can be hard to cope with when things do not go well. ESTPs want to live up to their full potential and are always working hard to get things done properly. They do enjoy living in the present moment, which can sometimes cause them to take chances that they regret later one. This can cause the ESTP to be rather hard on themselves, even when they shouldn’t. ISFPs are very moral individuals, which can sometimes cause them to be hard on themselves. They enjoy living in the moment though, and prefer to soak up everything that the world has to offer. They are adventurous but quiet people, constantly going with the flow. ISFPs often only fear failure when their loved ones set higher expectations for them. They will take the criticism of the people they love very harshly, which can be harmful to the ISFP. ESFPs are carefree people, who enjoy living in the present moment. They want to make everything in life fun and enjoyable, which means they often do not fear failure. ESFPs understand that everyone makes mistakes, and will often be okay with failing themselves. They are great at getting things done when they find something very important, and will often be able to accomplish these tasks without failure. ESFPs will only become upset by their failures when their loved ones seem to judge them for it.